mmh.. the Batman sprite is bigger than 8x16, isn't it? You can take a couple sprites and mash 'em together for a bigger sprite. A lot of NES games seem to have done that. But it counts as multiple sprites. dibs on the life aquatic. I've never used any of the NES restrictions so I figured I should at least try my hand at them. Would this qualify? The sprite is two parts, they don't have 5 colors. since i honestly don't know how to avoid some of the restrictions, i get kind of loose with the rules, and if you want to correct me, go right ahead. 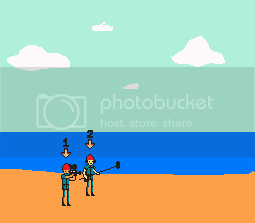 two players, go around the island taping various aquatic creatures. Is there a thread explaining how exactly the color and resolution restrictions work? Yeah I meant to explain what all that means. Raster, 1 perm alpha etc. I don't expect anyone to spell it out for me but maybe steer me in the right direction so I can enter this and subsequent Mockup frenzies.